Sit up straight! Victorian children were constantly reminded to sit up straight and walk with straight backs. 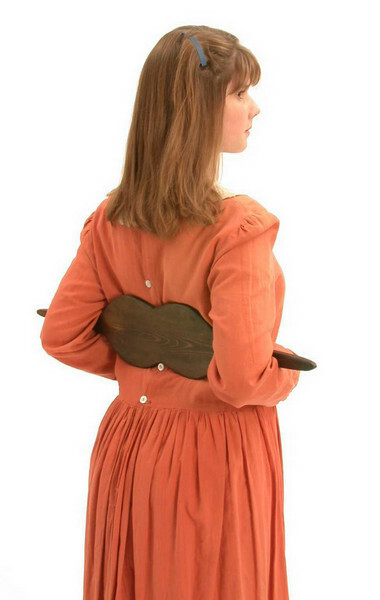 To prevent slouching and encourage good deportment, wooden back straighteners were placed behind the child's back, with each arm hooked over the narrow ends. The boards were often strapped in place and worn throughout the day. This forced the child to sit up straight and walk with a straight back, as it was painful to do otherwise. The device also acted as a restraint on the arms and hands and was used to prevent fidgeting and other misdemeanours in the classroom. It must have been, at best, very uncomfortable to wear one of these boards for any length of time and at worst, very painful. In one account of the use of a back straightener, a violin string was added that stretched across the child's back and cut into her if she slouched. Boards were made from woods such as elm, mahogany and oak and some had decorative splats, such as heart-shaped. There are records to show that boards like this were still in use at the end of the 19th century.